Bangladesh celebrated the World Tourism Day with colourful programmes under the global theme "Tourism and the Digital Transformation". A colourful rally was brought out in the city on September 27 in observance of World Tourism Day. A day-long programme was observed by the government and different organisations, as well as Bangladesh Tourism Board and Bangladesh Parjatan Corporation. A rally began from Matsya Bhaban intersection in the morning and ended at TSC intersection in University campus. 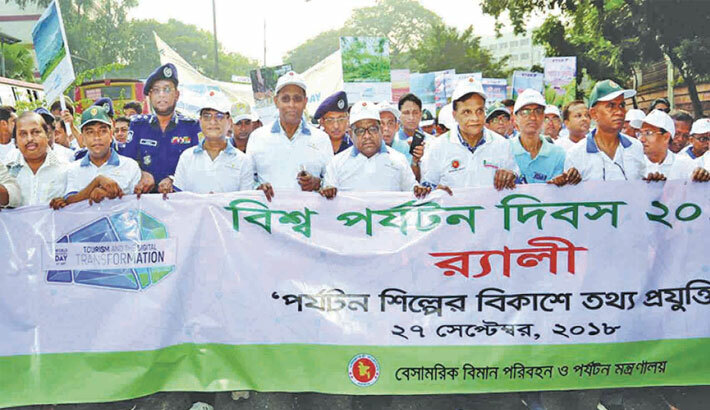 Civil Aviation and Tourism Minister, AKM Shahjahan Kamal participated at the rally. Members of the Tour Operators Association of Bangladesh, Aviation and Tourism Journalists' Forum of Bangladesh (ATJFB), a platform of journalists covering aviation and tourism affairs, Bangladesh Tourism Board (BTB) and Bangladesh Parjatan Corporation (BPC) also participated. Meanwhile, Rabindra Sarobar in Dhanmondi, one of the capital's popular cultural venues, wore a colourful look as a three-day tourism festival "Biman Tourism Fest 2018" began on September 27 afternoon. ATJFB with the administrative support of BTB hosted the festival. Different organisations showcased various tourism-related products and activities from September 27 to 29. Civil Aviation and Tourism Minister AKM Shahjahan Kamal inaugurated the festival as the chief guest. A discussion on the tourism master plan centring the Sundarbans was held on the second day. The festival was sponsored by the national flag carrier Biman Bangladesh Airlines as the title sponsor and powered by US-Bangla Airlines. NOVOAIR, Rangdhanu Group, Regent Airways and Way joined as co-sponsors while Well Food and DBC were partners. BPC, ATAB and TOAB also joined hands as strategic partners of the fest. Meanwhile a Three-day Tourism Fair was also held at the Bashundhara International Convention Centre, titled Seventh Asian Tourism Fair-2018, organised by a vernacular tourism related magazine - Parjatan Bichitra, in cooperation with BPC and BTB. The fair was inaugurated on September 28 by Tourism Minister, AKM Shahjahan Kamal, while the Chairman of Parliamentary Standing Committee of the Ministry of Civil Aviation and Tourism, Faruk Khan, Bangladesh Parjatan Corporation Chairman, Akhtaruz Zaman Khan Kabir, Philippines Ambassador to Bangladesh, Vicente Vivencio T Bandillo and Indonesian Ambassador to Bangladesh, Rina Prihtyasmiarsi Soemarno attended as special guest. At least 120 booths of domestic and international tour operators travel trade agents, hotels, motels, resort, domestic, theme park and international airlines offered various tourism packages on the occasion of the festival. The five-star hotel, Pan Pacific Sonargaon also organised a four-day Bangladeshi Food Festival from September 27-30. The Peninsula Chittagong has always been in favour of promoting tourism in Bangladesh and they took an initiative of Road Clean Campaign in front of the hotel in observance of the World Tourism Day on September 27.